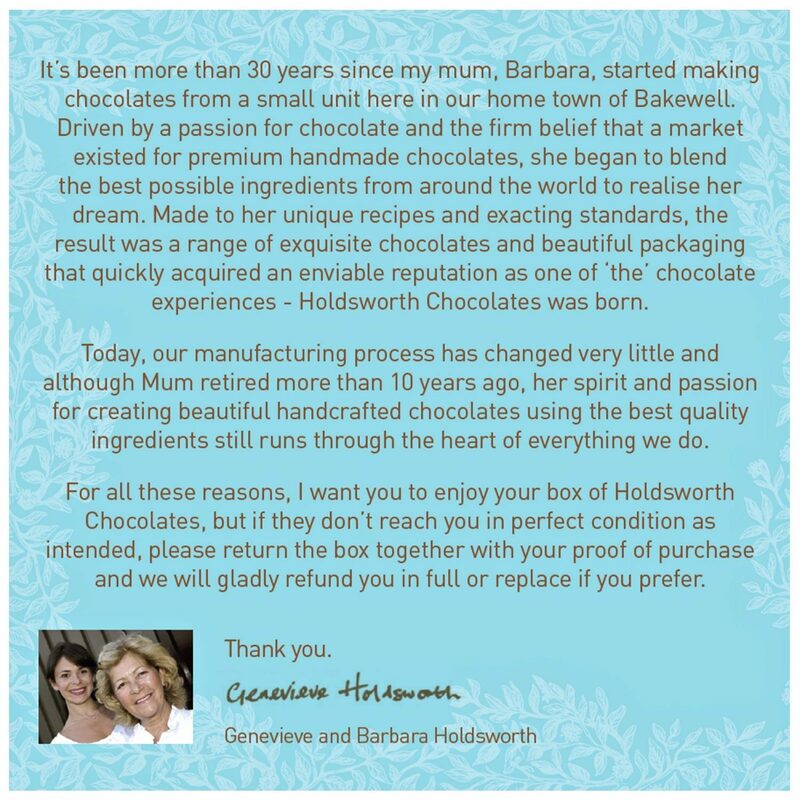 Holdsworth Chocolates signature collection of handmade truffles, pralines and creams. Discover a decadent Crème de Cacao Truffle, a mouthwatering Strawberry Cream and Classic Marc de Champagne Truffle and many more. This collection also comes in Signature Alcohol Free – Click to view. Ingredients: Milk Chocolate (Sugar, Cocoa Butter, Whole Milk Powder, Cocoa Mass, Emulsifier: Soya Lecithin, Natural Vanilla), Dark Chocolate (Cocoa Mass, Sugar, Cocoa Butter, Emulsifier: Soya Lecithin, Natural Vanilla), White Chocolate (Sugar, Cocoa Butter, Whole Milk Powder, Emulsifier: Soya Lecithin, Natural Vanilla), Butter (Milk), Fondant (Sugar, Glucose (Wheat), Water, Preservative: Sulphur Dioxide), Caramel (Glucose Syrup, Sweetened Condensed Skimmed Milk, Sugar, Water, Cocoa Butter, Modified Starch, Thickener: Agar, Flavours, Emulsifiers: E471 and Sunflower Lecithin, Salt, Acidity Regulator: Citric Acid, Preservative: Potassium Sorbate), Alcohol (Neutral Spirit, Crème De Cacao, Orange Liqueur, Grand Marnier®, Amaretto, Rum, Marc de Champagne), Praline Paste (Hazelnuts, Sugar, Emulsifier: Soya Lecithin), Fudge (Sugar, Glucose Syrup, Sweetened Condensed Milk, Palm Oil, Butter (Milk), Emulsifier Soya Lecithin, Flavouring, Salt), Fruit Purees (Glucose Syrup (Wheat), Invert Sugar Syrup, Strawberries, Orange, Lemon, Raspberry, Beetroot Juice Concentrate, Natural Flavouring, Ethanol, Acidifier: Citric Acid, Colouring Plant Concentrates (Carrot, Pumpkin, Apple, Safflower, Lemon)), Salt Flakes, Natural Flavouring (Strawberry, Raspberry, Rum, Lemon, Coffee, Orange (Propylene Glycol)), Natural Colour (Beetroot), Coffee Granules.